The Laurier Avenue United Church is a church in North Bay, Ontario. Built on the corner of Laurier and Hammond Streets, the church was officially dedicated in 1928 and originally shared services with the West Ferris and Trout Mills United Churches. The modest church building has undergone several expansions, including a significant addition in 1964-1965. Records were donated to Nipissing University's Institute for Community Studies and Oral History (ICSOH) in 2008 by Joan Holmes on behalf of Dale Pepin. Francoise Noel transferred the records to the Archives in 2014. 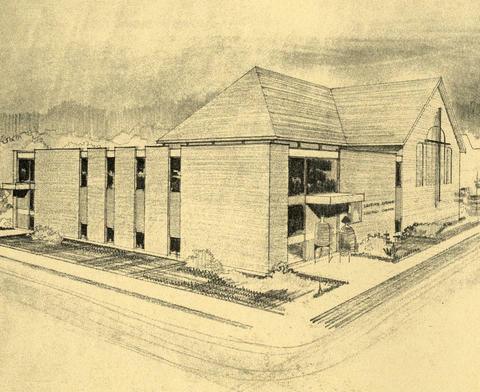 The image linked to this description is a drawing of the Laurier Avenue United Church from a program for a dedication service held in 1965 (in File 0244-01 - Dedication service). Newspaper clippings photocopied and discarded in January 2016.